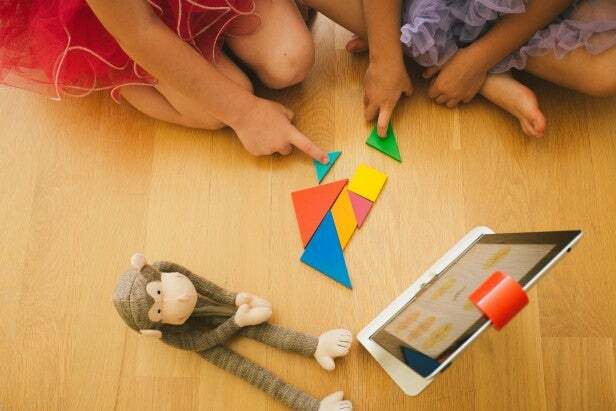 The Osmo starter kit is an iPad accessory that will work with all your iOS tablet devices. The pack includes a stand, camera reflector, a box of letter tiles and another set of coloured tiles. It’s easy to repack everything back into the sturdy box, repeatedly – important for anything aimed squarely at the junior market. Slide your iPad into the sturdy base, jump into iTunes and download the compatible apps. There are currently four available – Tangram, Newton, Masterpiece and Words. Once downloaded, your undercover education mission is about to commence. The seven multi-coloured tiles that comprise Tangram is an interesting start. Gameplay involves replicating the on-screen image with said tiles in the playing field – an A4 paper-sized area that the attached reflective camera can pick up. In Easy mode, it offers up the colour and shape for you to copy and, as you increase the difficulty level and progress, it will take away colours and individual shapes, making it quite a challenge far beyond it’s 6+ age guide – although superb for collaborative sibling or parent play. As you achieve your on-screen challenge, the app recognises completion and takes you on to another shape/level. It can be a tad tricky at first to learn where the playing field is. For the first few games, I struggled to get the camera and app to react the way I’d like. I soon got the hang of things, however. The collection of blue/red letter tiles are required for Words, a hangman-style game where a series of images are presented on-screen and two players compete to identify them. This is done by placing your letter tiles in the play area. Guess correctly and the word is partially spelt on the screen; guess incorrectly and your letter is sent to the top and the amount of guesses you have left drops. Accuracy isn’t an issue at all with Words: throw word tiles casually around, and the camera catches them with ease. The game-play becomes more tricky as you progress, plus there’s a word learning part of the app for kids to brush up on their spelling too. With Masterpiece, you’re invited to place a piece of paper slightly under the stand on a flat surface and select from one of the many outline images included inside the app. Once selected – from a simple star shape through to an outline of America and all its individual States – place your hand on the paper and the reflective camera shows your hand on the iPad covering your chosen shape’s outline. Now you can start to trace this on-screen shape onto the paper using any pen or pencil. This can be tricky at first, but becomes straightforward enough pretty quickly. In addition to choosing from these outlines, you can use one of the images already on your iPad. 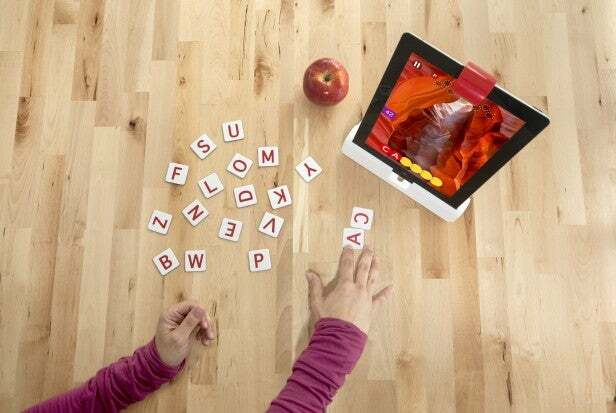 Or, using the camera, take a picture and it will translate this into an outline for you to draw – with Osmo, self portraits are set to be the new selfies. Now, the Newton app was a surprise since it feels a little more game-like than all the others, and is definitely more of a challenge for older kids – yes, I’m referring to you. Once again, you provide the paper and pen and, when started, the game pumps out coloured balls from the top of the screen in a constant drip. Your challenge is to redirect them onto targets by drawing lines on the paper – which are replicated on the screen – for the balls to bounce off, or chutes for them to slide down. Whatever your grey matter can imagine, jot it down and marvel at the internal physics in the app. After a few gos you’ll realise that just turning your heavily scribbled piece of A4 around will affect the action. Grown-ups, this is the perfect time to get a mini-white board and give the kids a slightly damp cloth, since this will get serious! Think Cut the Rope or Where’s my Water – but much more interactive. 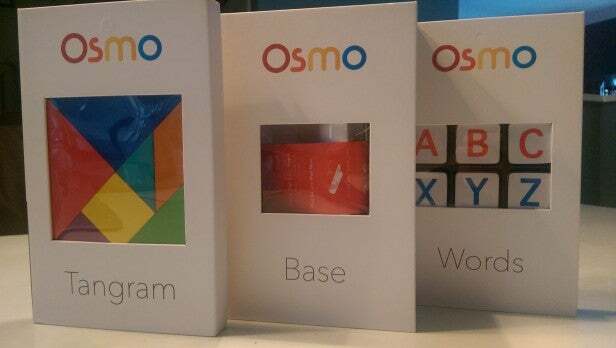 If we said Osmo is the bridge between real and digital worlds, you’d likely raise an eyebrow at this near-pitch-perfect corporate marketing mumbo-jumbo. But it’s a pretty accurate description, actually. App-toys appeared in a blaze of glory a couple of seasons ago, but the below-par offerings meant that the category hype turned into tumbleweed almost instantly. However, we think this bit of kit is the long-overdue game-changer. 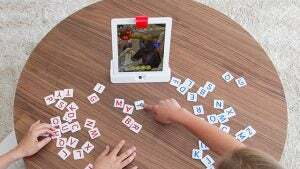 The post Osmo iPad accessory appeared first on Trusted Reviews.